BCS a 2019 Hugo Award Finalist! 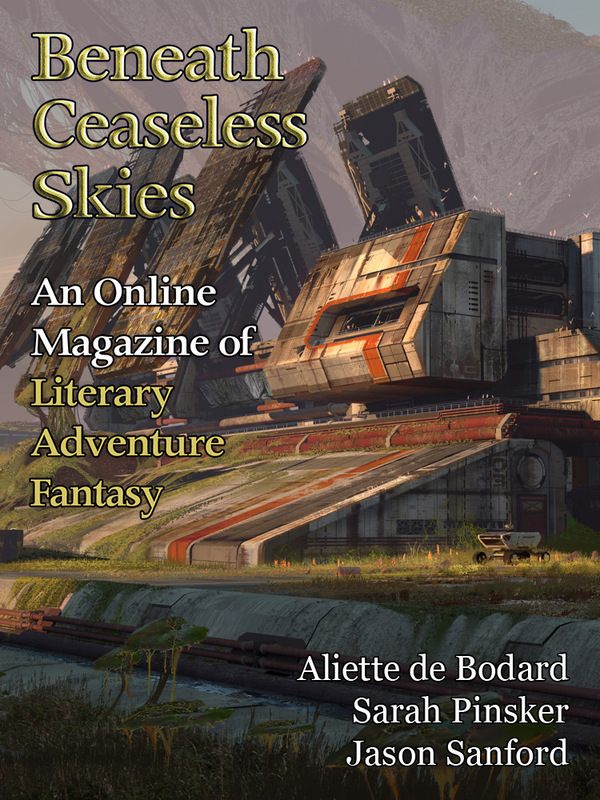 The bonus story fom BCS #195, our second double-issue for BCS Science-Fantasy Month 3, and the two bonus podcast episodes are now live on the BCS website. The bonus story, “The Mountains His Crown,”by Sarah Pinsker, tells of farmers trying to subsist in the face of autocratic and technological heedlessness. All the stories in this double-issue were available two weeks ago for BCS ebook subscribers. Subscribers get every issue a week before the website, delivered directly to their e-reader or phone, and are supporting BCS at the same time. Visit our exclusive subscription partner WeightlessBooks.com for details. The first bonus podcast episode is BCS 171: The Mountains His Crown, the Sarah Pinsker story, guest-narrated by Folly Blaine, who has narrated multiple past BCS podcast episodes including BCS 157: Bent the Wing, Dark the Cloud by Fran Wilde and BCS 146: Sun, Stone, Spear by Carrie Vaughn. The second bonus podcast is a new episode of the BCS Audio Vault: The Breath of War by Aliette de Bodard, her Nebula Award-finalist science-fantasy tale of colonialism and grief and loss from BCS Science-Fantasy Month 2 back in 2014. It’s introduced by the author, detailing the inspiration for the title and the colonialist theme. If you’d like to get both these double-issues from BCS Science-Fantasy Month 3 as ebooks delivered straight to your reading device, they are now available at Weightless Books as a specially priced bundle. And if you missed the special issues of the first BCS Science-Fantasy Month in 2012, featuring Yoon Ha Lee, Chris Willrich, and Megan Arkenberg, or the issues of BCS Science-Fantasy Month 2 in 2014, featuring Yoon Ha Lee (again! ), Aliette de Bodard, and Seth Dickinson, you can get them in specially priced bundles too: BCS Science-Fantasy Month 2012 and BCS Science-Fantasy Month 2014.